It also gets WiFi and Ethernet support so you can send your files wirelessly. There aren't many 3D printers out there that have two extruders for putting out two materials at once, and of those even fewer are ready to hit the market. But Ultimaker's latest device is up to the task. The Ultimaker 3, which starts at $3,495, has two extruders that can hold different materials so you can produce more intricate prototypes. The device also comes with WiFi and Ethernet support, in addition to a USB port, so it can receive your jobs over the internet. One of the most popular (and, frankly, more interesting) applications of this dual-material capability is using the second nozzle to print integrated support structures that you can remove the inside of your print-out. 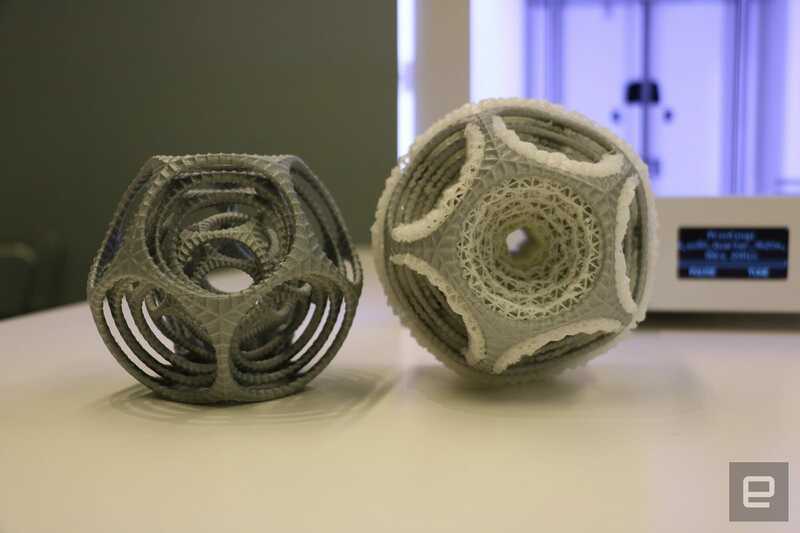 In a recent demonstration, Ultimaker showed how it was able to create a complicated cage-like structure by using a water-soluble material for the support structure against the nylon-based primary material. Then, by dunking the whole thing in water for a few hours (depending on water temperature and movement), the support structures dissolve, leaving behind a clean-edged product. To prevent the materials from crossing over each other mistakenly, the Ultimaker 3's extruders will also dodge each other if they get too close. They slide back up into their housing and stop printing, not unlike how a turtle hides its head back in its shell when danger is near. Lights on each nozzle will indicate when the head is hot, cool and ready, so you won't have to hurt yourself when swapping out the cores. The Ultimaker 3 also adds NFC readers to its spool racks, so it can automatically detect the material you've chosen and adjust its settings accordingly. It also offers automatic bed-leveling, and has an on-board camera so you can watch your project's progress without leaving your workstation. The new extruders can print up to 215mm x 215mm x 200mm each, while their output volume when used together is 197mm x 215mm x 200mm. The company is also offering the Ultimaker 3 Extended for larger build capacities, and it can produce a taller 197mm x 215mm x 300mm print. 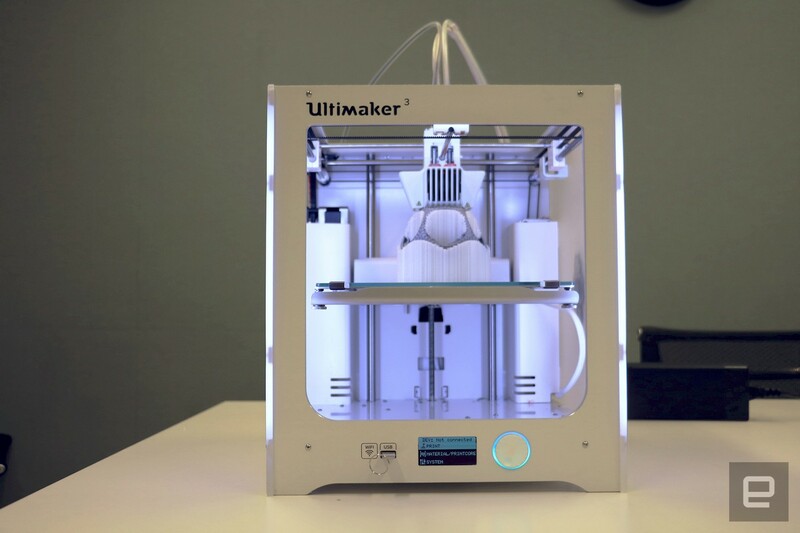 The popular Ultimaker 2+ and 2 Extended+ will continue to be available for $2,499 and $2,999, respectively.